Discussion in 'Work in Progress' started by frd, Jan 24, 2019. 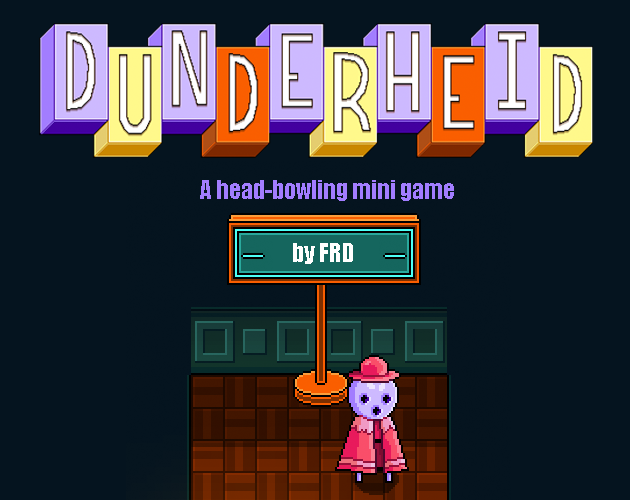 Hi, I'm working on a game called Dunderheid. Time spent so far - 2 days. Niels, JCJ, Bayesian and 6 others like this. - Added randomly spawning pins to knock over, crystals to collect, zoom, screen shake, scoring and bonuses, entrances and exits to rooms, transitions, bowling directional arrows, a few more animations and generally juicied it up a bit. Starting to come up with a bit of a plan for how the game might work. Time spent so far - 4 days. Triangle, RichHopefulComposer and EvanSki like this. Quirky! - I like it! Definitely an interesting mechanic. It definitely needs some form of push back like how to win or lose and disability when you lose your head. Maybe the pins march around or and you got to fight off rain drops since you got an umbrella. Maybe the umbrella has different abilities with and without your head (just random thought). Triangle and frd like this. Edit: something about the dimensions has me thinking it's a side scroller every time I look at the GIF. Maybe it's just the lack of details in the room. To be seen..
Niels and frd like this. Conceptually, I think this is brilliant! 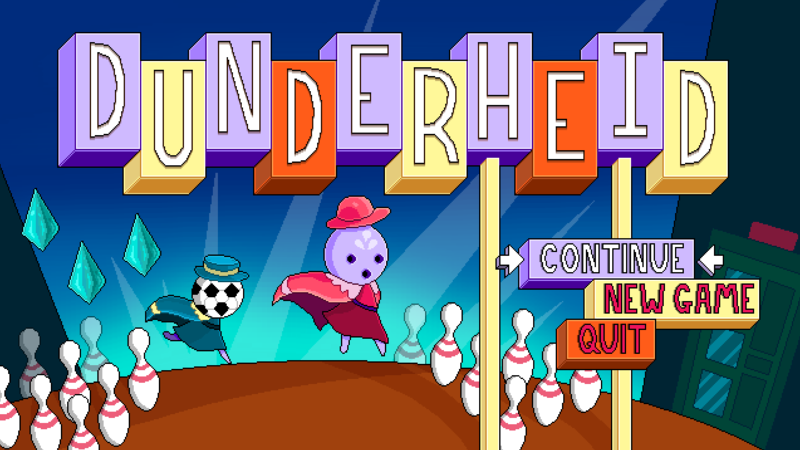 The character is really cute and the bowling game mechanic is really interesting and I can see how it could lead to many different sub-mechanics related to interacting with buttons, enemies, puzzles, traps, etc... The umbrella is an interesting mechanic too, and it could make a great "secondary" weapon or support item to the bowling ball head. I would definitely keep working on this, as it looks charming and has great potential! Triangle, JCJ, frd and 1 other person like this. He needs a rounder shadow. With this top down view, the shadow on the ground would almost appear as a circle, but here it's a sliver. Combined with the (common and excusable) stylized side-on perspective of the character himself, it really does feel like a platformer at first glance. The super dark walls aren't helping, either. They almost feel more like holes than walls, making it even harder to register this scene as top down. The shadows going straight down compound this even more, hahah! Changing the black to a dark brown/red would also help a lot to show that we're looking at ceiling rather than bottomless pits. Pure black surrounded by bright colors is always going to feel like a hole in the screen. I still read the scene as top-down, but I can see how others might read it as side-on at first. Triangle, mamacato and frd like this. Wow, thanks so much for all the feedback! It’s really helpful and encouraging. Siolfor the Jackal and RichHopefulComposer like this. I thought it was a side scroller at first as well. Thought. “Floor is not well defined”. shows promise, I noticed your wallpaper disappears during the camera shake and no one else mentioned it. Thanks again for the comments and feedback, it's amazingly helpful. I've made changes in response to comments here, and added some new stuff too. - Added three enemy types, lighting, new background artwork, changed shadows, developed scoring system, worked on mechanics for bumper puzzles, and started to define levels and player progression. Time spent so far 10 days. Nocturne, Triangle, Simon Love and 4 others like this. Very impressive, dude. I love how the enemies can steal your head, that's fantastic. Have you considered having them dribble the ball with their feet and kicking it at you? Oh, you could also have basketball enemies that bounce their basketball heads! Those gifs show a lot of promise, the last one gives me hopes for cool puzzles and stuff. Nice work, dude. Triangle, Bayesian and frd like this. Thanks man, you’re right about the soccer enemies, I’ll definitely work on the animations for them kicking their heads. mamacato and Siolfor the Jackal like this. Lots of potential in that. Looks like a lot of fun! You might want to give Kirby's Blowout Blast a try. It's the same mechanic and the enemies spawn in and they basically are pins. Game looks enjoyable. Thanks for the recommendation, it’s really cool seeing how they dealt with similar mechanics. In comparison that game has a far more progressive feeling of flow, and I can see now that mine is about stumbling back and forth. As Canadian I would think a stick and puck is in order. mamacato, frd and Siolfor the Jackal like this. Great concept, I think you've got something quite unique here. I never knew you could make something cute out of bowling balls. I'll always see faces on them now. I don't know if it's just me but I think the character shadows are too circular now. Maybe it's also because the other objects' shadows are still more oval shaped. frd and Triangle like this. Looks great! The walls and details finally allow me to see it as a top-down game. I can't believe you did this in such a short time. Any hurdles you had to face that you can share with us? frd and JCJ like this. Yes the walls help a lot with perspective. I’ve always liked your games. They are always interesting and have unique art style. Can’t remeber the names. The shadow people. The others reminded me of Eric Carle style illustrations. Thanks very much. Loads of hurdles really. What seems to work for me is letting go of my original ideas, and just running with anything simple that works. If I get stuck on something for more than 40 minutes or so I ditch it and make do with a simpler effect instead. I was aiming to make a mystical game about sheep herding but I’ve got one about throwing a ball. This concept is really awesome. I love your character and I really think it should be a balance of "poor but workable melee if in deep sh..." vs "Head that is super useful". I would really focus on the head, like you seem to be doing, however I don't see the sports stuff fitting (bowling and soccer). It just distracts from your art style and environnement the sports look brings nothing. The rolling head + the bouncing and anything you can come with in regards of navigations or attacks with the head is great! Focus on that. I could see that head being the magical body part of that character and with this head you could have 2 different types of attacks or moves. Physical (rolling, bouncing, etc) and magical too. (spells for navigation, magic attacks). You could also be original and not make a dungeon game with random generation. I know its alot more design work/effort but nowadays EVERY SINGLE dungeon game does that and its really getting boring imo. frd and Siolfor the Jackal like this. Feeling like the end is in sight now. Added dialogue, puzzle scenes, a boss, more background artwork and started work today on music, sound and the menu screen, here's how that’s looking. Thanks for the support and criticism over the past month, I really appreciate it. Bearman_18, nacho_chicken and frd like this. Hmmm. Can I build for Windows if I only have a Mac? I presumed not but I don’t know. You can dual boot windows on a Mac using the built in Bootcamp app. You of course need a windows 10 license. Download the developers evaluation version, and use either Virtual Box (free) or Parralels. That Windows version should include everything to build the Windows version. O.Stogden and frd like this. Yeah we come from a world of apple. It was a bit of adjustment to the windows world here. I have access to my wife’s windows laptop for submission to game Jams. Didn't realize that was a thing, only just got my first Mac device 2 weeks ago, using Windows 7 32-bit on it as I had a key from years ago laying around. Good find. Still primarily use Windows on it, as it's an old Macbook so Apple removed support from it ages ago, but still has decent Windows support. I'm the opposite way round and run a Mac VM on my Windows 10 PC, as I bought a MacOS license from the Apple Store. Is there an evaluation version of Mac which means I didn't have to buy the OS? Thanks for the information about publishing for Windows. I need to have a think about what my priorities are. Toque and Siolfor the Jackal like this.